If you are one of our regular followers, you probably already read our other articles about Adidas‘ on pack promotions for men. 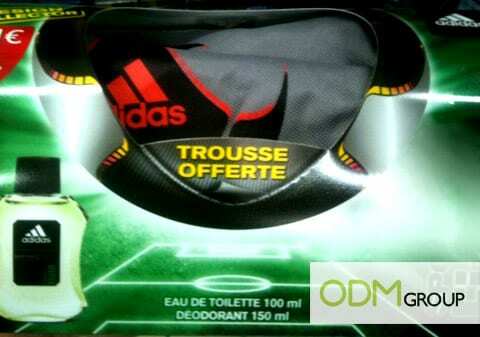 If you walked around any supermarket in France recently, you probably noticed this offer allowing you to get a free Adidas toiletry bag with every deodorant or perfume bought. To receive this promotional gift, simply purchase a complete Adidas toiletry kit made up of an aftershave/perfume. Are toiletry bags good on pack promos? Particularly for men, they don’t have a huge budget for cosmetics and beauty products, so running an on pack promotion is a good way to make men buy Adidas products instead of another brand’s ones. Therefore this free toiletry bag could be a great item to draw more sales in. Moreover, if the item is branded with the Adidas logo, it could further help with brand recall. This item could come in really handy when travelling. Ce type d’offre promotionnelle, les opérations on pack, permettent de pousser un consommateur à choisir une marque plutôt qu’une autre pour un produit de consommation courante. En effet, les hommes n’ont pas un budget “beauté” aussi élevé que les femmes en général, il est donc important de trouver des astuces marketing pour les pousser à l’achat. L’utilisation d’un cadeau promotionnel, en l’occurrence d’une trousse de toilette, est un véritable plus dans ce cas-là.